4 - 5..........Kira von Romberg. 1988: 98-97-97 = 292 points (1st). 1987: 91-96-95	= 282 points (7th). Biene vom Estetal was the winner of the D.V. Meisterschaft in 1988 with 292 points and gained her FH tracking title. She was later exported to the U.S.A. where she became the winner of the working UDC National Championship in 1989. Her sire, Ali von Langenhorst, passed the Körung 'for life' with highest rating for hardness and working drives plus winner of numerous international show championships while her maternal grand-dam, Cora vom Papenkamp, was a three time winner of the D.V. Meisterschaft. 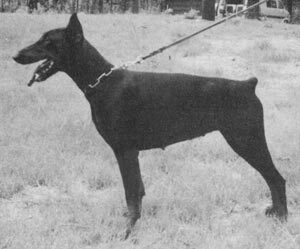 Biene's litter-brother, Bo vom Estetal, was the founder of the van de Berkensingel	Kennel in the Netherlands while her brother from a previous breeding, Arne vom Estetal, was the founder of the vom Grenzturm Kennel in Austria.